A few pics of the latest round of the new Scalex F1 series. Another of Devious Daves fantastic repaints. Ran well in standard Tourers. Dave following a well tuned Vectra. Bo's Ninco Mercedes suffered the NC1 affliction. 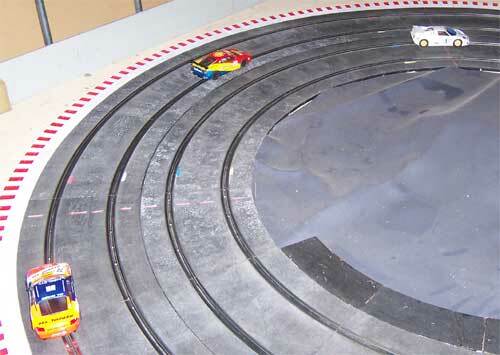 Fast track and 12 volt setting on transformer meant Nincos were much slower than Scalextric and SCX. We could almost make a cuppa waiting for the car to reach the end of the straight. 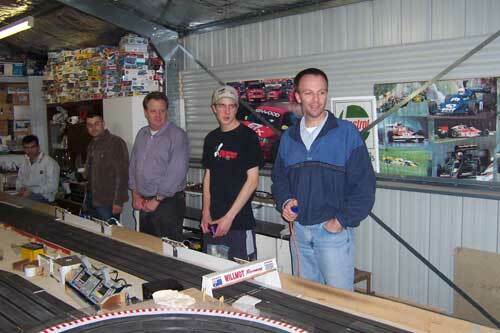 Ninco's were 0.8 seconds a lap slower. 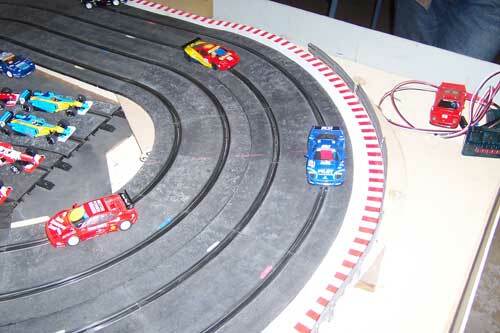 Three Proslot Ferraris competing against Joe's GT1 F40 SCX. Daves Shell 360 looked a treat. Bump bumping off the track behind but catching back up next lap in the pic below. He is not as slow as he makes out. He has just been unlucky. Bugatti leading this bunch. Cameron in the NC1 Ninco Porsche again suffering from a low voltage. He did well when in a competitive car, especially for a first timer to the track. Right to left is Graeme, Jacob, Rob, Jamie and Cameron seated while the warmup is on. Last heat of GT, GT2, GT3. 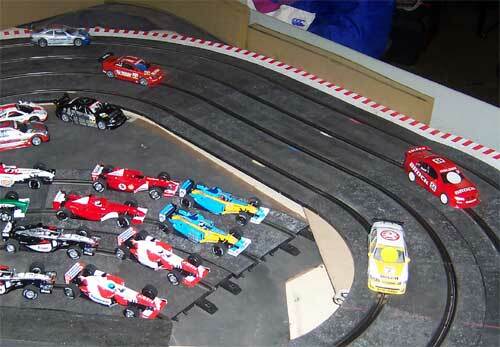 Renault leads Ferrari repaint followed by BAR repaint and lonely Bumps Williams. Coultard tried to blame his average performance on a bit of debris picked up from a driver. Eventual winner Dave Schumacher was fast and consistent. Bloody Toyotas were extremely quick. Alonso getting upset with Webber again. Full grid shot showing new varitions against old. It was an interesting first round which showed the differences between supposedly similar cars. Williams and Mclarens had stronger magnets but were too far forward causing wheelspin down the straight and poor traction through the corners. Renaults were very quick as were Toyotas. Quickest was a brand new Toyota. 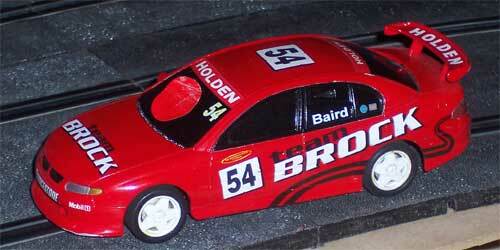 I will leave it to Dave to comment on his repainted cars which he kindly painted and made the decals for. Bo also helped here in finishing Jamies BAR for him. Some interesting results to contemplate now. Great pics vince keep up the good work or should I say do not both ! well our auslot members would like to keep seeing them I think. Fantastic work on the F1's, please keep the pics rolling in. Devious Dave, they have certainly been keeping you busy, can't wait to see the finished Jag's. Have you guy's considered a proxy race? I'd be happy to tune an F1 or GT/1/2/3 car and send it in, what are your regs for each class? That is a great idea and is something that could be used anywhere on this forum. We will see how we go at present as the cars are uneven in standard form and some rule changes may happen. We have to check with the Bernie "Devious Dave" Ecclestone on any rule changes though as he runs the circus. His team is also the No1 team so he may be hard to persuade though as knowone listens to the minnows down the back of the grid. I don't think he wants us to get too many points as he will have to pay the travel bills. Bump comes from the northern suburbs so would cost a lot in kerosene. We will see how we go at present as the cars are uneven in standard form and some rule changes may happen. We have to check with the Bernie "Devious Dave" Ecclestone on any rule changes though as he runs the circus. His team is also the No1 team so he may be hard to persuade though as knowone listens to the minnows down the back of the grid. My goodness Vince, what are you suggesting? Hopfully nothing radical like a level playing field?!?!? I think that, purely for the sake of scale realism, the Ferrari team should use Slot-it motors and multiple magnets. Just to keep it "real". and the Minardis could use rubber bands. In a desparate attempt to avoid last place in the soon to start Willmot F1 series 2004, Ralf began negotiations to switch his Williams for a Toyota. Ordered on Tuesday, one arrived on Thursday "for testing". Engineering analysis over a glass of a cheeky domestic Chardonnay showed the Toyotas have the button magnet moved a bit more to the rear. Apparently McLaren drivers are similarly disadvantaged like the Wiliams. As Ralf complained bitterly about lack of traction this may be a competitive advantage to the teams from Japan and France (Renault). The rear bodywork on the Williams is very close to the rear tyres and Ralf was concerned tyres may touch during cornering, given shimming the rear axle is not allowed. However, in breaking developments today, FIA technical Liason Vinno advised Ralf's manager, Sir Henry Crumfeld Bump (Captain, 77 Royal Household Husbands retd) that secretly Devious Bernie and Joe Schumacher have tested another Williams with a modified magnut mount "in testing" and found the Williams now matches the other cars. Suspecting devious motives on the part of the Ferrari and Toyota teams in desparate attempts to maintain so-called "parity", Crumfeld Bump offered the offending Williams for supervised tests to validate this outrageous claim. As we speak, Ralf's Williams is in transit to "a secret location west of Sydney" where FIA officials will validate the modifications proposed by Devious and The Schu. In other equally amazing developments, during this hastily arranged transfer, Crumfeld Bump managed to find a parking spot at Milsons Point, to deliver said Williams to the aforementioned FIA official. Even more amazing was that after feeding the meter 80 cents (for 15 minutes -- I don't care that its got views of the Harbour, I only wanna park !!! ), the meter returned $2 in legal tender. All proceeds of this transaction go to aid the "Find Ralf a decent car for 2004" fund. Not tax deductible, but will consider bulk billing. If you do no good, you can always blame concussion and spine fractures. Maybe you should buy yourself a wheelchair a la Sir Frank. Now that would be authentic. BTW I have met Sir Frank Williams. Very quiet but extremely polite man. I have a photo to prove it. I don't need to buy one, Joe the Schu already has one. We've threatened to let his tyres down, raise the track to eye level, allow only 30 seconds between heats and the bugger still outdrives us. The only problem is he doesn't keep any secrets about his setups so the rest of us have no good excuses for being beaten. But his marshalling skills, now there's a joke.... he once put my Ferrari 166 back in the slot backwards. I lost a lap just laughing. As the receiving FIA official I have inspected said Williams and can find no excuse for the poor driving of the younger Schumacher. The offer of a Toyota drive has been rejected and he will now have to wipe Webbers windscreen when the real heir to the F1 scene moves to the Williams team later this month. 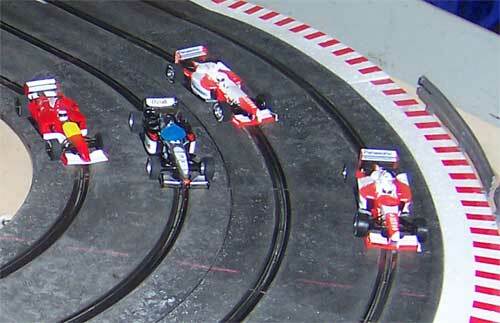 Here are the results from the first round of the Scalextric F1 race. 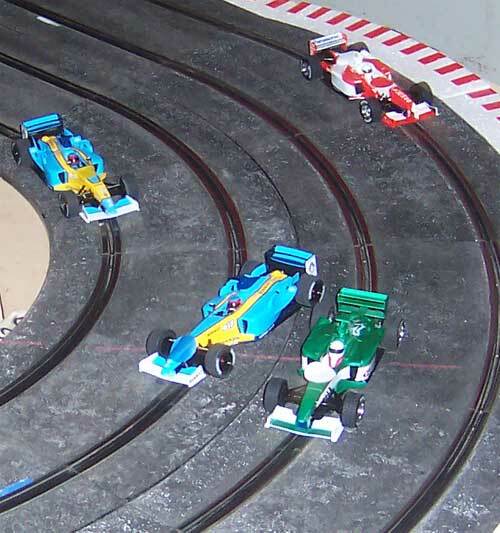 I heard that the modified magnet-position tests have restored parity for the McLaren and Williams teams with the Toyotas and Renaults? Yes and no they have feel to much like a magnet car with the 2m thick magnet, my renault feel much better to drive with the 1 1/2 m magnet . 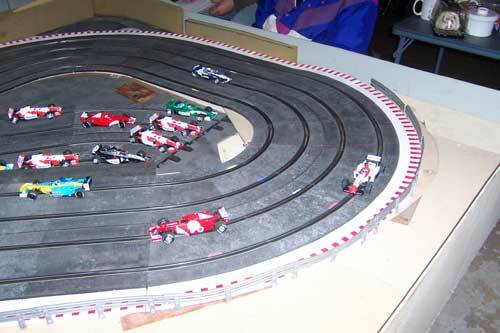 We try the McLaren of vince's on his scalextric track, to much magent for such a light car I think,but time well tell. This track looks really cool! 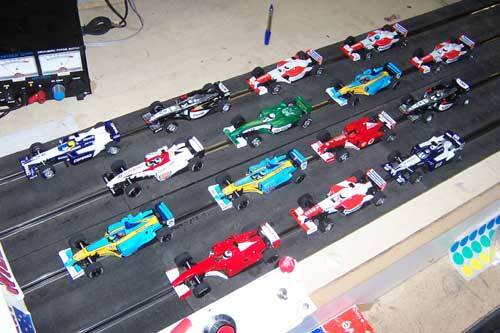 And I love the sight of all those F1 Scalex cars lined up on the grid there - they look sensational! C'mon boys ... get those tyres burnin' !!! Gotta use those F1 hotties to the fullest! 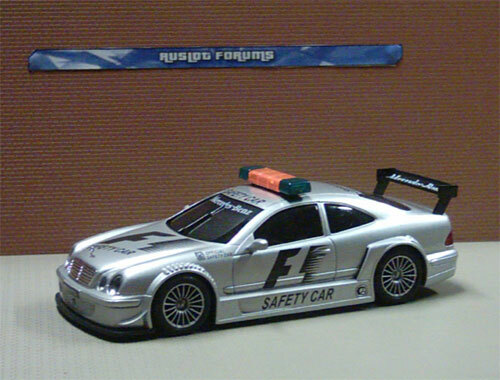 Here is the Ninco F1 Mercedes Clk safety car for the next round for the wilmot F1 race on the 21/8/04 stay tune. So, no pictures from round two as yet. Vinno must be having trouble getting the film out of that box brownie of his.